Despite Many Threats, Afghan TV Satire Mocks The Powerful : Parallels Afghanistan's top political comedy sketch show mocks aspects of day-to-day life in hopes of shaming the government to clean up its act. The cast of Zang-e-Khatar, or Danger Bell, has tackled everything from corruption to bad roads, and they've received death threats for doing it. Zang-e-Khatar, or Danger Bell, makes fun of government officials and other powerful figures in Afghanistan. Cast members are shown performing a skit during a taping of the show. Saturday Night Live. The Daily Show. Zang-e-Khatar. OK, maybe you haven't heard of that last one. But the comedy-sketch television show is well known in Afghanistan, where Zang-e-Khatar, or Danger Bell, is one of the most watched programs. For eight years, the popular satire show has been broadcast on Afghanistan's Tolo TV network and has mocked everything from corruption to bad roads in hopes, its producers say, of shaming the government to clean up its act. When the show tapes an episode, there's no live audience. There's no makeup artist. And, there's no dressing room. The four actor-comedians, donning robes and ratty wigs, stand to the side of a small soundstage. One wraps himself in chains. They take their places on the set, a mock courtroom. The first skit of the day's taping is the trial of a militant. He's accused of killing people with explosives he placed on a couple of donkeys – a tactic used by the Taliban. The chained defendant fidgets on the stand as the prosecutor presents a seemingly airtight case. But, the proceedings take a turn when the judge accepts the defense's argument that the donkeys were to blame. He frees the militant and issues a warrant for the owner of the animals. There's chaos in the courtroom. Hanif Hamgam plays the judge and is the creator of Zang-e-Khatar. After finishing the segment in one take, he says the skit is an indictment of Afghanistan's corrupt justice system. "The government is trying to release those people who are actually criminals and suicide bombers," he says. Hamgam says the government only prosecutes the little guy. For example, he says if a butcher is supposed to deliver 100 kilograms of meat and is three kilos short, he ends up in jail for a year. "But the people who are corrupt and have like $300 million missing from their office or department, they are actually free and can do whatever they want," he says. It's the kind of pointed message that Zang-e-Khatar routinely sounds out in its sketches. Hamgam says the show is about holding the government accountable. "We try to focus on the gaps and the government actually now is watching us very carefully and clearly," Hamgam says. Zange Khatar (Danger Bell) is a satirical panel show that reviews the 'issues of the day'. As the crew changes the set for the next skit, the studio starts to rumble as a helicopter flies over – a regular occurrence in Kabul. Despite the fact that Tolo TV is the No. 1 network in Afghanistan, it doesn't have soundproof studios. But Zang-e-Khatar doesn't owe its popularity to its production values. Instead, it's due to the fact that the skits and songs exposing corruption, wrongdoing or hypocrisy have prompted reforms and resignations. "Because of our programs, three mayors have been fired by the government," Hamgam says. While the Afghan audience loves the show and the results it gets, those who are mocked don't always laugh it off. "There have been lots of cases where we received threats from the officials," Hamgam says. "Even our colleagues were beaten up by those people we have made programs about." They have been the subject of death threats, arrest warrants and investigations by the attorney general's office. "We are usually hard on the government — especially in a country like Afghanistan where if you make fun of somebody, they really get angry at you," says Masood Sanjar, general manager for broadcast of Tolo TV's parent company, the Moby Group. While Hamgam says the show's staff does have to self-censor at times and there are certain officials too powerful to make fun of, Sanjar says there is only one red line. "We really don't want to violate the law," he says. That's why Moby has a rigorous vetting process for its shows. Before an episode airs, lawyer Habibullah Moradi reviews the program on an old desktop computer. The first skit of the episode is a fake interview segment with a host and an analyst — a common scene on Tolo's news channel. The actors are discussing an actual case of an Afghan girl tortured by her in-laws. They were recently released from jail after serving only a year of their 10-year sentences. The actors make a few searing jokes to highlight the injustice. He thinks some of the jokes will be taken the wrong way and flags them to be cut. The actors know that not everything will pass muster. Later in the segment, they make an inside joke about something that was censored from a previous show. Moradi recognizes they are making fun of him and he cracks up. Moradi continues through the show taking notes. The third segment features a woman covered in a traditional blue Afghan burqa. She is cast member Nafisa Nafas, who plays a character named Khala Makhfi, which means "hidden aunt." She does field interviews, often confronting government officials surprised to be challenged by a fully covered woman. Her segments are designed to challenge stereotypes of Afghan women. In this episode, she is in a hospital interviewing a boy who claims his teacher beat him. Moradi is a little nervous about the veracity of the boy's story. He continues through the show and marks down a few more jokes and comments he says should be deleted. But, the rest of the episode still has plenty of punches the government just might want pulled. Even though Zang-e-Khatar is no laughing matter to many officials, there are clearly those who feel it plays a powerful role in Afghan society. Actor and producer Nasratullah Haidary points to one example when a citizen went to parliamentarian with a complaint. 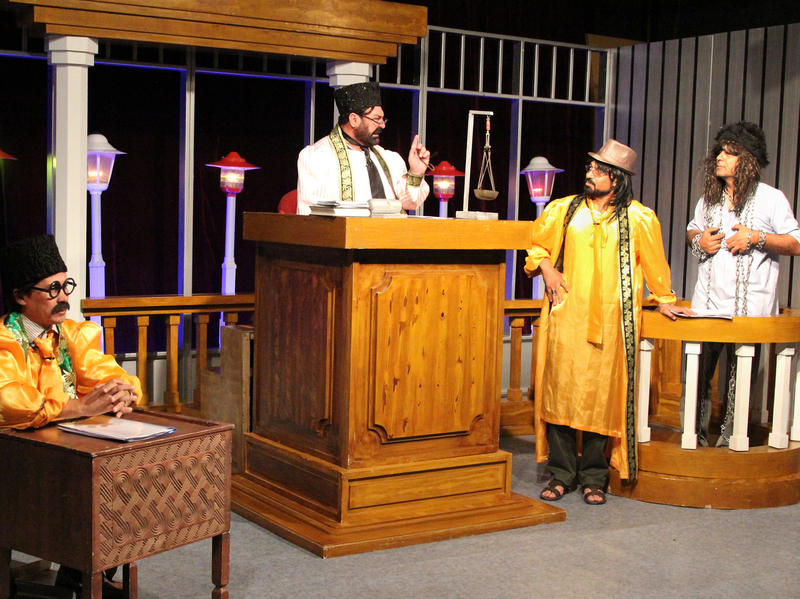 The politician wrote to Zang-e-Khatar asking the program to raise the issue in a skit. NPR's Sultan Faizy contributed to this report.